The plan called for activating something called a floodway, a pocket of land across the river that the Corps could legally flood to relieve the pressure on Cairo’s levees. Once water on the river gauge at Cairo rose to 61 feet — or got close enough to threaten devastation — the Corps was supposed to blow up the levee that protected the floodway. See a day-by-day reconstruction of one critical week in 2011 and how delays and indecision cost millions in avoidable damage. When the Corps dedicated the floodway in 1928, it was a swampy patch of timberland on the Missouri side of the border, which farmers and loggers were just starting to transform. Property owners accepted a one-time payment of roughly $17 per acre for the government’s right to flood their land. In the eight decades that followed, it became some of the most fertile farmland in the state, home to more than 200 people. Now, as the water rose in Cairo, those farmers argued their land was too valuable to sacrifice — especially for Cairo. As the water rose, congressional representatives for the Missouri farmers were writing to President Barack Obama and arranging for them to speak to Corps leadership. The Missouri attorney general filed a lawsuit to stop the floodway from getting activated. The farmers even had a seat on the river commission that would decide their fate. The Corps ultimately detonated the levee to activate the floodway, but not before causing millions of dollars in unnecessary damage to Cairo and surrounding communities, according to a report from the Illinois Department of Natural Resources. That report is echoed by the engineer for Alexander County, whose seat is Cairo, and city residents who said the agency’s delay led to the flooding of many rural homes and farmland on the Illinois side of the river that could have been saved if they’d opened the floodway sooner. The Corps’ job is to manage the flood risk posed by rivers, but in this case, it made the damage worse. An analysis of the timeline by ProPublica and Reveal from The Center for Investigative Reporting shows how Maj. Gen. Michael Walsh, the Corps official in charge, missed several opportunities to act sooner, going against his own advisers. At one point, Walsh held off on a key step because it would “create a stir with the public, the press and politicians,” according to a report Camillo wrote that serves as the Corps’ historic account of the flood. Walsh left the Corps in 2013. Through a spokesperson at his current employer, a consulting firm, he said he no longer represents the Corps and directed questions to the agency. When ProPublica and Reveal asked the Corps about the timing of activating the floodway, a spokeswoman said the agency’s deliberations were about the preparation of the floodway — not whether Walsh would ultimately pull the trigger. She did not address allegations that the delay stemmed from Cairo’s demographics and lack of political clout, or how the Cairo region sustained unnecessary damage. Phillip Matthews, a pastor, community activist and chair of the Democratic Party in Alexander County, said he’s certain the Corps wouldn’t have stalled for a wealthier, whiter city. Since the 1800s, the Corps has protected riverfront communities by building levees — earthen or concrete walls designed to confine rising water to a river’s banks. But during floods, all that water needs to go somewhere. Because levees constrict rivers, they make floodwaters flow faster and harder onto communities not equally protected. In 1927, the Corps got a lesson on this when a flood in the Mississippi River Valley made refugees of half a million people and killed more than 1,000. With the Flood Control Act of 1928, the Corps diversified its solutions. It designed a federal system of levees, dams, reservoirs, floodways and control structures to reduce flooding from Missouri to Louisiana. Known as the Mississippi River and Tributaries Project, the system is meant to withstand the worst probable floods, but only with the extra capacity the four floodways provided. To protect Cairo and surrounding communities on the Illinois side of the Mississippi River, the Corps set aside 130,000 acres between the Missouri communities of Bird’s Point and New Madrid to serve as a floodway. When the Corps first had to activate the floodway in 1937, government planes flew overhead, dropping pamphlets warning people to leave before the Corps broke the levee with dynamite. Farmers sued afterward, and courts ruled the Corps had been within its rights to flood their land. In the 1990s, the agency briefly considered buying all the land in the floodway and leasing it back to residents at their own risk. The payments would have been an explicit reminder of the ever-looming threat. But the Corps decided the more than $200 million price tag was too high. When the river began climbing in late April 2011, it was the first time the Corps had to seriously consider using the floodway since it blew up the levee in 1937. 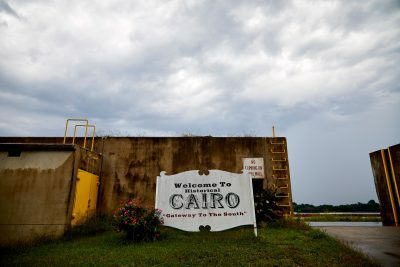 The Cairo gauge reached 49.8 feet on April 21, and a worst-case scenario forecast predicted it would exceed 61 feet in early May, enough to cross the red line that called for detonation. Walsh had the authority to blow up the levee at 58 feet, if the levees in the Corps’ flood control system deteriorated quickly. As president of the Mississippi River Commission, Walsh had the final say. 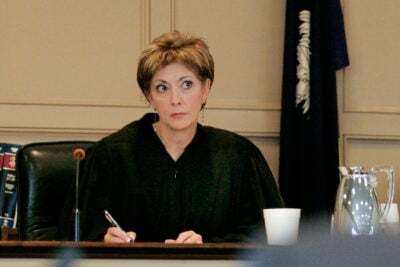 The other six members of the commission, a powerful group of presidential appointees that oversees navigation and flood control along the river, advised Walsh throughout. One of them, R.D. James, owned land in the floodway. Generations of his family’s wealth was bound to that corner of Missouri. As the flooding worsened, neighbors kept asking him for updates about the fate of their land. By April 27, floodway residents were ordered to evacuate. The Corps loaded explosives onto barges and sent them to Hickman, Kentucky. If the order came for final floodway preparations, it would take several hours to reach the part of the levee where the explosives would be pumped into the embankment. Farmers in the floodway weren’t about to let that happen, and they had politicians on their side. 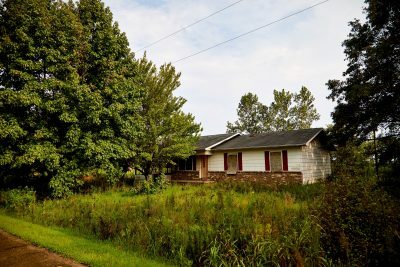 Missouri Attorney General Chris Koster sued the Corps, citing the area’s more than 90 homes, 200 residents and crops with “significant economic value.” Koster’s lawsuit said the Corps had “abused their discretion” by sticking to the floodway plan, because the agency hadn’t accounted for the relative change in property values. It wasn’t just politicians and farmers. 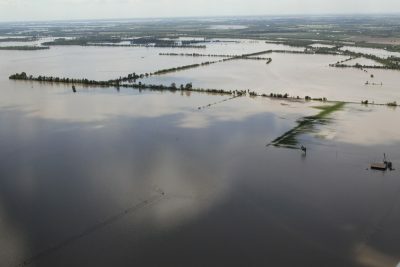 Some in the press characterized it as a tough call between saving the people of Cairo versus homes and farmland in the floodway. 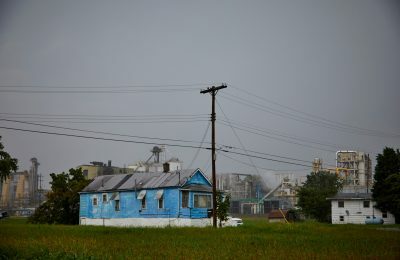 ABC News called it an “excruciating dilemma.” UPI presented Cairo’s concerns about becoming another 9th Ward next to a farmer who said he would be left with “nothing” if the Corps acted. And an April 27 editorial in the Chicago Tribune said Childs had exaggerated the risks, because Cairo’s residents still had time to evacuate. 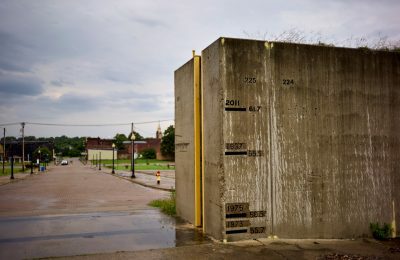 The editorial ran a day before a massive sand boil — a surge of sediment and pressurized water — erupted behind the floodwall that stands between Cairo and the Ohio River. It meant the floodwall was weakening, and crews from the Corps worked all night to stabilize it, as other “mega boils” emerged. When Walsh toured the site, he told a reporter it was the largest sand boil he’d ever seen. Cairo wasn’t the only place at risk; according to Corps designs, 2.5 million acres of land on both sides of the river would be safe if the floodway were opened. The levees in Fulton County, Kentucky, had so many sand boils that the area became “a sloppy mess.” Some parts of Alexander County had no levees at all and were simply swamped. 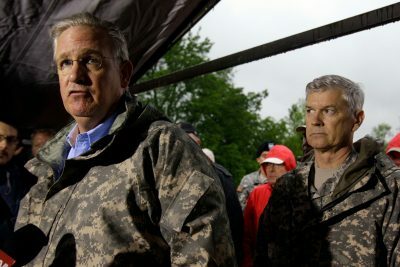 Over the next few days, senior Corps officials urged Walsh at least three times to pipe the explosives into the levee or otherwise accelerate the timeline. Each time, he held off just a little longer. 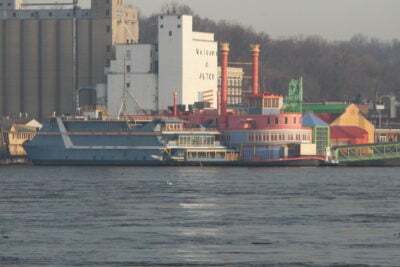 At one point, he declined a suggestion to move the barges to the levee, as it would draw too much attention, Camillo wrote. The last warning came the morning of May 1. Col. Vernie Reichling told Walsh the crew handling the explosives had less than 24 hours to load the pipes before the river would rise so high they wouldn’t be able to work safely. Walsh decided to wait and asked for another briefing in five hours. When the group reconvened that afternoon, Walsh went around the room. Reichling said they were behind schedule. According to the Corps’ floodway procedures, the explosives should have been fully loaded by the time the river reached 60 feet, but the agency hadn’t even started by then. James “looked forlorn,” his shoulders slumped, according to Camillo’s account. He told Walsh he would support whatever the general decided. Walsh gave the go-ahead, but thunderstorms and lightning delayed the process until the next morning. By the time the levee was prepped and ready to go, it was 10 p.m. on May 2. The water was 61.7 feet high. Loud booms announced the explosions, and a wave as tall as a house poured through the breach and into the floodway. When the levee blew, the river dropped nearly half a foot in an hour. Water levels in south Alexander County “were directly affected by the timing of the operation of the” floodway, said a 2012 report from the Illinois Department of Natural Resources. The report concluded that millions of dollars in flood damages could have been prevented. If the Corps had opened the floodway when the river was a foot lower, 41 fewer structures would have flooded, out of nearly 200 total. At 2 feet lower, the county would have avoided more than a million dollars in building-related damages. Camillo, now executive director of the Mississippi River Commission, said the Corps’ floodway procedures aren’t set in stone. The thresholds include flexibility to account for factors such as weather forecasts and how fast the river is rising. He said he understands the frustrations of Cairo residents, but the city’s value wasn’t a factor. Nor was the lawsuit from the Missouri attorney general, which ended when the U.S. Supreme Court declined to hear an appeal, leaving the ruling in the Corps’ favor. Walsh’s decisions were based solely on the river and levee conditions, Camillo said. Tyrone Coleman, Cairo’s current mayor, said that he’s grateful the city’s levees held, and that neighboring communities might have been spared if the Corps had acted sooner. But he said the agency was in a difficult situation, and “there is no way I would blame the Corps” for what happened. Across the river in the floodway, the farmers have rebounded far more quickly. This story was produced in collaboration with Reveal. Find the Reveal podcast on your favorite podcast platform or at revealnews.org/podcast. Less than 1 percent of the farmland was permanently damaged, according to University of Missouri Extension agronomist Sam Atwell. “The land itself came out better than we thought,” Atwell told the Columbia Missourian. He estimated that about half the farmers had crop insurance, and a 2013 paper said residents successfully planted 100,000 acres of soybeans and wheat that year after the water drained away. Even so, they’ve argued in court that the government should compensate them for their losses. Their position was backed up by a 2013 Supreme Court ruling on another flood-related case. Last fall, President Donald Trump appointed James, Walsh’s former colleague on the river commission, to lead the Corps’ civil works division, which oversees levees and other infrastructure. A ProPublica/Reveal review of property records shows James and his family own 3,000 acres in New Madrid County, with at least 800 acres within the floodway. According to his financial disclosure forms, the net assets of James and his wife — including farmland, rental income, family trusts and a cotton gin — are worth at least $9.4 million. James now oversees a system that is interconnected, in which choices involving upstream reservoirs and other features could factor into whether the floodway gets used. In federal ethics paperwork, he says he’s recused himself from decisions that affect his farm. James’ office didn’t respond to a list of questions about potential conflicts of interest, except to say that the person in charge of floodway activation is the current president of the river commission, not James. Ethics experts said the true test of James’ conflicts won’t come until the next catastrophic flood. He could seek an ethics waiver, as other government officials recently have, which would allow him to be involved in decisions affecting his farm. While wealthier landowners farming in the floodway had a chance to plead their case to the Corps during the 2011 flood, residents of the tiny town of Pinhook didn’t get that chance. Pinhook was founded in the 1940s by African-American sharecroppers. The floodway was the only place they could get anyone to sell them land, and they made the most of the opportunity, building homes, a general store and a Baptist church. Its population reached 250 by the 1960s. The town shrank as children grew up and moved away; by 2011, fewer than 50 people lived there. When the waters rose that April, they packed what they could and fled days before the levee blew. They saw their homes in aerial footage on television, covered in water up to the rooftops. When they returned, whole rooms had been warped by floodwater, fan blades drooping from ceilings like the petals of dead flowers. In the weeks that followed, their buildings were looted, stripped of wiring and burned. Today, there’s little to suggest there was a town where Pinhook stood. Weeds grow in the cracked foundations. Utility lines have been subsumed by thick vines. Its former residents return just once a year, on what they call Pinhook Day, an annual homecoming held on Memorial Day weekend. This year, Debra Robinson Tarver, whose grandfather co-founded the town, greeted them; she was mayor when Pinhook was destroyed. Unlike the other floodway farmers, Pinhook residents decided not to sue, feeling a lawsuit would be a longshot and eat up money they didn’t have. Tarver tried to re-establish the town on higher ground, with money from a federal grant and the Federal Emergency Management Agency, and donated labor from the Mennonite Disaster Service volunteers. 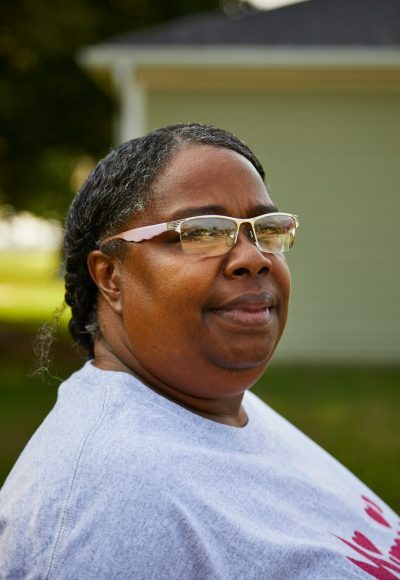 After seven years in limbo, Tarver and a handful of other Pinhook residents moved into homes in and just outside Sikeston, Missouri, this April. Everyone else who lived in Pinhook has either died or moved away. While the Corps’ official history makes note of James, and the perspective of white farmers in the floodway, it does not mention Pinhook. Camillo, who wrote it, said he was preoccupied with following the agency’s top officials as the crisis unfolded. Their itinerary, evidently, did not include a visit to the only town in the floodway. “For Pinhook people especially, it’s almost like they never existed,” said Todd Lawrence, an English professor at the University of St. Thomas, who co-published an oral history about Pinhook intended to help correct its absence from the official Corps record. On Pinhook Day, there was singing and praying. Children got four-wheeler tours to learn about what the place once was. A message resonated through the day: We existed. ProPublica news applications developer Al Shaw contributed to this report. Hear more about Pinhook and how the Corps’ levee control decisions have made flooding worse for some residents. 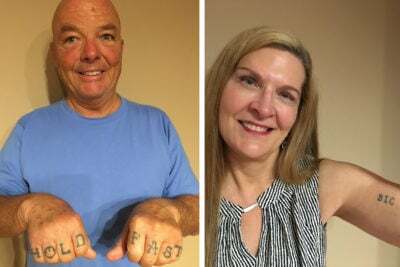 Listen to more from Reveal at revealnews.org/podcast or wherever you find your podcasts.